A little awhile ago I was able to do a swap with Justine from Productrater. She has a great blog that reviews a variety of beauty products high end and drugstore. 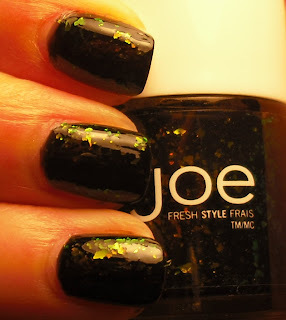 I swapped her some Hardy Candy Concealer and Wet n Wild eye palettes for some Joe Fresh polishes. As far as I know this brand is only available in Canada, so it was a real treat to get some of these. Thanks Justine! Twilight is a black jelly polish with iridescent flakies that flash green/orange/gold depending on the light. I took all these pictures so you could see how the flakies change color depending on the light. This is a very unique polish. I love seeing a flakies in a deep base. I also like how this kind of a murky color, it's different take one most flakie polishes I've seen! I was lucky to swap for this one, too. It's very pretty! Such a pretty, different color! I love how the flakies are kind of hidden, but not so much that they don't show up. Wow, that is so unique! I'll have to keep an eye out for it, I love the Joe Fresh polishes. I just swapped for some of this too. Now I want it even more!!!!!! This color reminds me a lot of Nfu-Oh 60 which is one of my favorites ever! 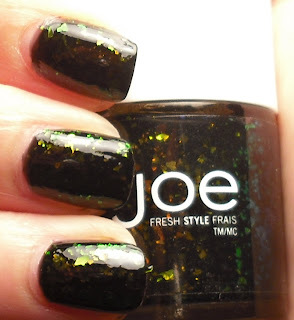 I'll have to try some of this Joe Fresh polish!